Hi everyone. I am glad to report I feel awake this morning, and although I still woke up a lot last night, I went to bed fairly early so I think that early sleep helped compensate for all the waking up. We have summer temperatures right now and it's making me wish I was on my summer break, mainly because I also finally feel like getting back into the studio. I may not have a lot of art time today, but I am still happy to have the foggy head gone. So Jo picked an awesome theme at Art Journal Journey. It's Flora and Fauna, and I love the theme. I have been keeping a Nature Journal for the last few months and even though I haven't done any art since coming home from Japan, I have a bunch of pages that work perfect for this theme. The brown paint on this page got there because I painted a burlap page on top of it. But I liked the effect. I started by stamping this hawk image 3 times and then coloring them in with markers and a white pen. Then I quickly painted the tree and added the stamped quote. I am linking up over at Art Journal Journey. I've started working a bit on my Japan photos also, so hopefully soon I will have some more to share with you. Have a great day everyone. I just realized what time it is and I need to get ready for work. What a gorgeous page! I am totally in love with it! Thank you very much for joining AJJ again! Such a fabulous idea with the hawk used three times! Cool! Great you feel more awake now! I am very tired just now - my brother is here and that's much more work with him. No art time- but I enjoy his company - he is such a lovely boy! Lovely images, I really like the burlap effect. Your experience in Japan shows in this piece. Hard to believe you QUICKLY painted the tree! It is perfect! 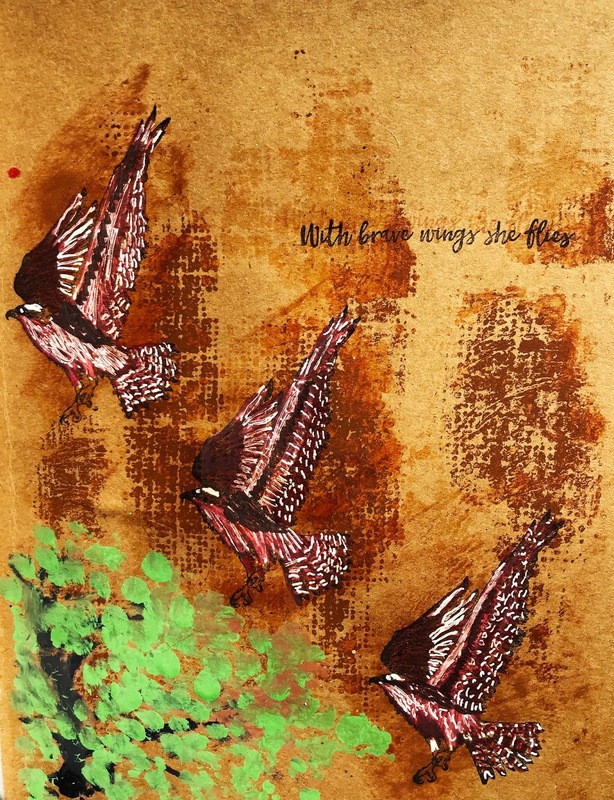 I really love your birdie page today - and the burlap really gave it some wonderful texture. Hope you have a good day - not too long til the weekend. What a beautiful page, I like the way you coloured the birds. I would NEVER have known those hawks were originally stamped, because they are so beautifully colored in. Isn't it amazing what we can achieve even after we make a mess on a journal page? The brown blob worked in your favor and it made the page even more interesting. I'm simply thrilled you were able to join us today at Art Journal Journey. And it's good that the fog is beginning to lift, too. This is an awesome page, I love the birds in flight and the background looks so textured, a super idea to paint the burlap on a page you can use for other creations. Glad you are feeling less tired. Hope you had a wonderful holiday Erika, jet lag can be a real menace, although I have a foggy brain most days!! I'm glad you are feeling more with it today and look forward to your photographs of your journey. Love the look of your drawing on the natural background, it's a great theme Jo is hosting and i'm enjoying seeing everyone's creations. Wonderful earthy colour tones, and I love the bright pop of green as your birds take flight. I'm sorry I've been such a terrible blog-visitor lately. It sounds as though you've been having plenty of adventures... Japan? Lucky you! Awesome page. I love the quote. The other day, a giant shadow passed over the Zensical garden. We watched a hawk (most likely a Red-tailed Hawk) ride the thermals looking for something good to eat. Glad your fog has lifted and hope you get some art time. Summer soon! When's school out? It sure has been a long time in coming but it will be here. Meanwhile, glad you have pages in store -- I like this one! Glad you got back from Japan OK and are about over the jet lag. (I wake up at 2 or 3 and can't get back to sleep and I don't have jet lag!) I like the burlap brown on your beautiful art piece. Worked out great.